Rathore in jail, at last! What's the significance of the Prime Minister's visit to the Valley on June 7? It is an important step in trying to put the dialogue process back on track. It's important that a simultaneous dialogue process takes place between New Delhi and Islamabad, and New Delhi and the state. Often we have found that either Delhi is talking to the state or Delhi is talking to Islamabad; seldom they talk to both at the same time. Therefore, I think it is important that Dr Manmohan Singh's offer be taken at face value. It is important to understand that he is a man who is committed to finding a solution to this problem. Now the Prime Minister has opened the door to dialogue. Let people start taking advantage of it. What do you want from the Central Government? The Government of India has been very generous in its support to Jammu and Kashmir. New Delhi has been very forthcoming in its assistance, in its help, particularly when difficult times have come. Obviously, I would like the Prime Minister to, perhaps, give a little shape to the dialogue offer — what it is, and what he expects from those who are to respond to this offer. We look to the Prime Minister to reiterate his government's and the UPA's commitment to zero tolerance to human rights violations. And in ensuring that, any such incidents are treated seriously and dealt with in a transparent and open manner; these are dealt to the satisfaction of all of us. Also, there should be some sort of a road map in terms of specialist assistance that we believe that Jammu and Kashmir requires to put the state back on track. Your main opposition party, the PDP, is calling for the withdrawal of troops and the Armed Forces Special Powers Act? It's unfortunate that the PDP only remembers these issues when they are out of power. This would have been taken with a lot more seriousness if we had heard these voices from Mufti Saheb as Chief Minister. It is odd for him to start giving the list of human rights violations when he sits in the opposition; it would have been far more relevant if he had done the same as Chief Minister. As far as this government is concerned, we are determined that should the situation allow it, we will revoke the Armed Forces Special Powers Act before the term of this government expires. But before we are in a position to do so, we are working with the Government of India to find a more humane Armed Forces Special Powers Act. I think it's important to understand that the armed forces require a legal framework with which they can operate within Jammu and Kashmir. That legal framework should not give them impunity and immunity from any incidents or acts of human rights violations. About troop reduction, already something is happening. We have already withdrawn almost 35,000 troops from the Rajouri and Poonch areas. We have already withdrawn Central paramilitary forces. We are increasingly giving more and more importance and a larger role to the J&K police. So, we are actually doing what the PDP is only talking about. Our decisions are not politically motivated. The PDP is calling for self-determination. What is your government's position? It's important to understand that there is a difference between self-determination and self-governance or autonomy. Self-determination is calling into question the whole argument about a plebiscite. We as a party — I am talking about the National Conference — have been calling for greater devolution of powers to the state. We have been calling for greater autonomy for Jammu and Kashmir. Now what shape, size and form that autonomy takes is something for protracted negotiations between the Centre and the state to arrive at. We have the foundations of that in the Justice Saghir Ahmad Committee report, which was the result of the Prime Minister's roundtable initiative. That's a starting point. On the Hurriyat's hardline stand? It is important to understand that there is not one Hurriyat today, there are at least two. You have the Syed Ali Shah Geelani faction of the Hurriyat and you have the Mirwaiz faction of the Hurriyat, and they both are talking somewhat similar things but in different tones. Geelani Saheb's tone was obviously far more stark, far more shrill, far more confrontational. 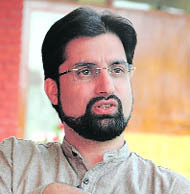 Perhaps, the Mirwaiz leaves some scope and some room for discussion and dialogue. Ultimately, those who are ready from within the Hurriyat to talk should come forward and talk. There are no pre-conditions to this dialogue vis-à-vis where the road map has to be. I don't think the Government of India has ever said that this is the starting point for the discussions. They have said you come forward and talk. Where the finishing point of this discussion is, that is open to debate. But we are not telling where it starts. Let us start from wherever. And the need to abjure violence? Absolutely, and I think that's only fair, nobody can talk with the gun pointed towards their heads. You have traditionally seen that dialogue has thrived in an environment of ceasefire or in the absence of violence. Violence is the biggest enemy of a sustained dialogue. Dialogue between India and Pakistan has traditionally broken down only because of a violent incident. Be it the attack on Parliament, be it 26/11, be it the Kargil war, it was violence that brought a premature end to whatever dialogue had been proceeding between India and Pakistan. And that's why the Government of India has rightly said that put violence aside and let's talk, and we are willing to talk on any subject, any issue — no other preconditions. I think that's reasonable enough. On the resumption of Indo-Pak talks? I think it's a healthy sign the fact that we are not jumping to the top level of the dialogue. It is not the dialogue that is taking place between our Prime Minister and their Prime Minister. It is at a far more managerial level — which is, our Foreign Minister talking to their Foreign Minister. Our Foreign Secretary talking to their Foreign Secretary, that's what we need. These issues, whether it is the issue of Jammu and Kashmir, or other issues like SAARC and Siachen, whatever they are they will not be solved by one round of dialogue. They will be solved by long-term discussions between the two countries. That has to happen at a more manageable level. After that, obviously, the Prime Minister will step in and take the dialogue to the logical conclusion. What's the biggest problem your government faces? The biggest issues the government faces today are, in the order of importance: unemployment, security and corruption. These are the three major issues that need to be tackled. Some steps have been made on the corruption front. It's also the area on which much more needs to be done. We had good successes on the law and order and security front; we had to role out a comprehensive employment package and policy that I think will gather steam as we go ahead. What is the message the Prime Minister will carry when he visits Srinagar? The Prime Minister has shown courage and farsightedness by restarting the dialogue process. As far as the dialogue with the people of Jammu and Kashmir is concerned, the Prime Minister is extending a standing invitation to everyone. The Prime Minister's message is clear that he would like to resolve people's problems through discussions and dialogue. Also, the Prime Minister is interested in sorting out issues with Pakistan through talks and dialogue. Pakistan also understands all this. The biggest message is that in the backdrop of turbulence and terrorism during the past 20 years, the Prime Minister wants to understand what the nature of problems are here and wants to resolve them through discussion. So, people should come forward and talk to him. Although on earlier occasions there were strikes, protests, black badges, etc., this time a majority of the people in Kashmir wants to resolve problems and do not want to indulge in such nefarious activities. There was a time when the militancy was at its peak in the state and some people thought that gun is the only solution to all problems. However, now gun is no longer acceptable to the Kashmiri people. Violence has no place here now and political issues have to be resolved through peaceful means. India and Pakistan should come forward for promoting peace and tranquility among the people of both sides of the border. What is your view about the self-determination that the opposition parties like PDP and also Hurriyat are raising? A section of people in Kashmir have heard about the self-determination 100 times. There are no takers for it now. It has no practical proposition. If somebody tries to remind the people about it, they consider it just a slogan. This course has already been exercised and exhausted. There might be some people who may like self-determination but majority wants the resolution of Kashmir problems through talks and dialogue. What are the steps you would suggest to the Centre which it should take immediately for confidence-building? The Ansari Committee recommended that there should be cross-border trade, cultural exchanges, etc. It should be implemented. There should be free movement of people without much paperwork. People need peace and dignity that should be given to them. Development is also the main need for the current situation. Economic problems must get resolved. The Prime Minister and Sonia Gandhi are deeply interested in resolving all these problems and issues. The Prime Minister's visit will give a fillip to the developmental process in the state. The Prime Minister and the Centre may come in agreement with the political leadership in regard to AFSPA. It is not a big thing. Ultimately, it has to go. 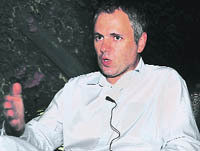 Since you are a coalition partner in the present government what priorities do you think Chief Minister Omar Abdullah should focus upon? I am of the view that the whole culture of the functioning of the government should change. There is rampant corruption, things do not move on without money. It is terribly shocking. Red-tapism in the government needs to be weeded out. There should be transparency and democracy should be in full public view. The government should not play politics with the youth and we should be sensitive to people's demands and aspirations. There should be no violation of human rights by anybody whether they are security forces or terrorists. Human rights violators should be punished severely. We need to purify the whole system of governance. You know the last elections were conducted here freely and fairly. We should win the hearts and minds of the young generation and they should feel that they are the citizens of a free and democratic country. Kashmiri people want a sensitive and corruption-free government with good work culture that provides them peace and dignity. How do you view the Prime Minister's intention of restarting the dialogue? The Prime Minister has always been keen on talks for the resolution of the Kashmir problem and has taken some confidence-building measures, though he does face problems and obstacles from the Congress itself and the BJP. I am happy he has expressed his intention for restarting the dialogue. People here generally are very cynical. When Dr Manmohan Singh is here, he will be able to generate a positive mood and response because we have to take up certain issues, including fake encounters. Since militancy has come down and the number of militants, official figures say, is just 500, we need to think about the withdrawal of troops from the Valley and revocation of the Armed Forces Special Powers Act. I hope the Prime Minister will be able to generate some confidence- building measures so that all groups/parties concerned come forward with some positive proposals, including the separatist groups. In terms of the PDP's agenda itself, you appear to have adopted a hardline approach similar to that of the Hurriyat, including the call for self-determination. Is this perception correct? Definitely not. The PDP is very lucky to have Mufti Mohmmad Sayeed, a tall leader of the stature of a nationalist party, who was the Union Home Minister and Tourism Minister. During his three-year period as chief minister, he adopted a reconciliatory approach and paved the way for reconciliation between the Kashmiri people and the rest of the country, maintaining the dignity and respect of the people and keeping the national interests in mind. Our party is trying to bridge the gap and restore the dignity of mainstream politicians. Nowadays mainstream politicians in Kashmir are seen as puppets. We don't want to be seen as a puppet. And the PDP wants to fight for the interests and dignity of the people of the state, keeping the national interest in view. The PDP is looking for such a solution under which the integrity and sovereignty of the country is not compromised; and at the same time Jammu and Kashmir enjoys the status of a semi-soverign state and gets unified with the other Kashmir (POK). What solutions do you have for the Kashmir imbroglio and to carry forward the peace process — do you have a road map? We need to reconcile the contradictions. There are three dimensions to the Kashmir problem: One is vis-à-vis the provinces of the region. There are parts of Ladakh and Kashmir which are totally isolated from the country, so is the case with some districts of Jammu like Rajouri, Doda and Poonch which want some kind of resolution. Some talk about independence, some talk about accession to Pakistan and this and that. But they are not satisfied with the status quo. There is need to reconcile with the contradictions of these three regions of the state so that the state stays together. The other dimension is between the state and New Delhi. We need to bridge the gap. There is need for decentralisation of the state from New Delhi so that the confidence of the people of the state is restored. There is another external dimension vis-à-vis POK and Pakistan. What's the PDP's approach to these three dimensions? The PDP is trying to address all three dimensions. There should be devolution of powers to the sub-divisional level so that the people from far off areas of the state do not have to rush for small things to Jammu and Srinagar secretariats. They will be able to manage their affairs as is being done by the Kargil Hill Council and the Ladakh Hill Council. We want more roads to be built for better inter-connectivity of the people. Due to the lack of proper inter-connectivity, people of areas like Gurez may think that they are closer to PoK than other areas of J&K. The important thing the PDP has started is the renegotiation of water resources. We do not want the Indus Water Treaty to be revoked as it is an international treaty and both India and Pakistan are benefiting from it. But all this should not be at the cost of the interests of the people of the state. The state must be compensated by the Centre either by way of money or by handing over these power projects back to the state. We can spend that money on infrastructure and development of the people of the state. And on Kashmir, what's your approach? The third dimension is the other Kashmir (POK). The people of J&K did not play any role in the division of India into India and Pakistan, thereby dividing Kashmir into two Kashmirs. It is India and Pakistan which divided us — the two Kashmirs. Now it is their duty to find such a mechanism so that we, the people of two Kashmirs, are unified. Though, as the Prime Minister has said, boundaries cannot be changed, we can make the borders irrelevant by allowing free trade and free movement of people. 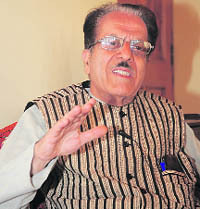 For this the PDP proposes that there should be a joint council for the two Kashmirs. And New Delhi should take five people from J&K from the Indian side and Islamabad should also take five people from the Pakistani Kashmir for the proposed joint council. The joint council is expected to work for the joint benefits of the people of both Kashmirs. By this way, the people of the two Kashmirs may be unified without undermining the authority of the Indian and Pakistani governments. The unification of the two Kashmirs may fulfil the aspirations of the people of the state. At the same, security forces need to be withdrawn from the civilian areas and the presence of the armed forces should be reduced. If there are violations of human rights the people of Kashmir start raising the issue of "azaadi" (freedom). Do you condemn violence by terrorists, including the Mumbai attacks? A: If these are committed in the name of Islam that is very wrong. As a citizen of this country and as a Muslim, I condemn violence and attacks. There is no justification for taking innocent lives. But, at the same time, the Kashmiri people should not be made to pay for any act of violence and attack in any part of the country committed by bad elements trained and supported by Pakistan. As a repercussion of the violence and attack, the peace process should not be stopped. External Affairs Minister S. M. Krishna is going to meet his Pakistani counterpart in July. Are you hopeful? The people want something positive to come out; they want results; they don't believe in talks and talks between the two countries. There should be something on the ground. The borders of both Kashmirs should be opened for people and there should be no curbs or hurdles in their life. It will generate some kind of enthusiasm. There should be free trade and there should be no curbs and conditions on people's movement. Your reaction to the Prime Minister's willingness to talk to anyone who is willing to give up violence? There is nothing new in the Prime Minister's offer since that has been the line held by the government for quite a while. As far as the Hurriyat is concerned, we are not a militant group, so we don't fall in that category. And I guess the people they are trying to cater to have their own views as far as dialogue is concerned. Nobody is against dialogue, but I mean I would speak for my organisation which has always been of the view that, yes, dialogue should be there. But see dialogue cannot move in a vacuum. The problem with New Delhi is that when things are heating up in Kashmir they come running to you. But the moment things are a bit calmer, they become completely complacent. So, there doesn't seem to be any long-term or short-term policy about how you deal with the Kashmir issue. So, this time we are hopeful that the Prime Minister will come up, rather than economic incentive, with a political package. What is the political package you are looking for? There are two aspects: one is that what we call an overall political process or a peace process which is aimed at the resolution of the Kashmir conflict and which can be achieved through dialogue among the three parties and they are India, Pakistan and Kashmir. The other aspect of the situation is the internal dimensions with New Delhi and Srinagar. This is also important in the sense that in that dimension you can take measures like what we called confidence-building measures or CBMs. 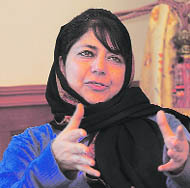 One is that in order to improve the situation on the ground let all the political prisoners who have been languishing in Indian jails for years be released and there be a review of all the cases of the people who are associated with Kashmir, whether on militancy grounds or other grounds. The second issue is what the Hurriyat is focussing on — the repeal of the black laws, especially the Armed Forces Special Powers Act. Even the Army is saying infiltration is down and so are militant attacks. So, I think it is high time they should look at not only the repeal of these black laws but also gradually thin down the troops. We call it demilitarisation of the Valley, whether from cities or towns; remove the bunkers and watch towers. Then, of course, the Prime Minister made a commitment last time he was here that there was going to be zero tolerance for human rights violations. So, I think it is high time we moved from a military-oriented policy towards a political approach which is what we hope the Prime Minister would be able to do. Your views on quiet diplomacy that the Home Minister had propounded? Nothing concrete has happened as yet; may be at the back channels, track one, track two levels. Some contacts were established but I think it was blown out of proportion; the whole idea behind quiet diplomacy has not worked. I believe it's not going to work in future too because it creates confusion and for no reason people start mistrusting others. Rather than going in for a quiet dialogue, let's go in for a formal dialogue as a quiet dialogue is never kept quiet! Will the resumption of dialogue with Pakistan help? As a Kashmiri, we welcome any India-Pakistan dialogue Basically, they are a link with that, so we welcome engagement. But the problem with the dialogue is that there is no mechanism, there is no system of engagement. Then Mumbai happened and it was a very sad thing; everybody condemned it and everybody was against it. But Mumbai became a sort of excuse for India to end the dialogue process. Not only with Pakistan but also the whole peace process vis-à-vis Pakistan and India came to a standstill. Pakistan has moved vis-à-vis their position, but India has never moved in the sense that they have not gone away from their traditional positions. But how can there be dialogue if terrorist attacks like Mumbai continue? If you are saying that we have to wait for the last gun to fall silent that's not going to happen. Even the Jihad Council or the parties outside the council are maintaining the minimum number to attack installations of the Army or paramilitary forces. But I think there is definitely pressure on them too. There is pressure from the establishment in Pakistan that they don't want this option to be explored right now because they are wanting to give peace a genuine chance. It would be wrong to say that Pakistan has not been genuinely addressing India's concern. The Hurriyat's approach seems to be very mixed? First of all, we have to understand that the Hurriyat is not a single party; it's a coalition. Over the years these parties have taken a radical stand. Now if we talk about reconciliation, talk about an out-of-the box solution, many people say that it is difficult for us to make this acceptable to our constituencies. Mr Geelani is going around and telling people that they have sold off Kashmir and they are going to sell off the sacrifice of the Kashmiris. It's important that if we have to reach out to the people who believe that New Delhi has never been sincere, we have to tell them that look let's give them a chance and see what they have to offer. We say very categorically that we cannot have a military solution to Kashmir and I think we are very open and very candid in our talk with even the Jihad Council. They are also realising this — why not give peace a chance?